Rum (sometimes wrongly referred to as Rhum) lies to the south of Skye between Canna to the northwest and Eigg to the southeast. 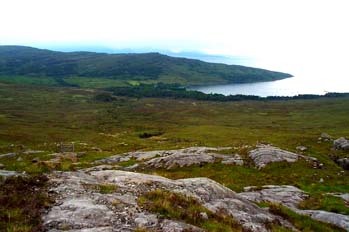 It is the largest of the Small Isles, and the fifteenth largest Scottish island but is inhabited by only about 30 or so individuals, all of whom live in the village of Kinloch on the east coast. Rum has been inhabited since the 8th millennium BC and provided the earliest known evidence of human occupation in Scotland. The early Celtic and Norse settlers left only a few written accounts and artifacts. From the 12th to 13th centuries on, the island was held by various clans including the MacLeans of Coll. The population grew to over 400 by the late 18th century but was cleared of its indigenous population in 1826-8. ​The island then became a sporting estate, the exotic Kinloch Castle being constructed by the Bulloughs in 1900, and was then purchased by the Nature Conservancy Council in 1957. It is now an important study site for research in ecology, especially of Red Deer, and is the site of a successful reintroduction programme for the White-tailed Sea Eagle. These days the islands economy is entirely dependent on Scottish Natural Heritage. Road To The Isles - Page on Rum from the website dedicated to the "Road To The Isles" which is the main route from Fort William to Mallaig. Internet Guide To Scotland - The Small Isles page from this information packed site features a section on Rum. 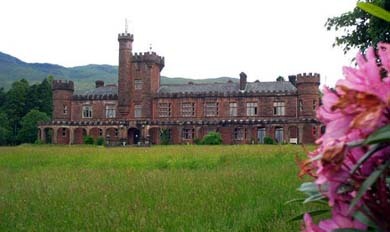 Included are details of a video which contains a tour of Kinloch castle. Undiscovered Scotland - Small Isles Ferry - Page from the always excellent Undiscovered Scotland site which gives you all the info you'll need on the Small Isles ferry. Boat Trips To Rum - AquaXplore run trips to all of the small isles and other locations from their base at Eilgol on Skye. One particular trip allows for a 4hr stop on Rum.